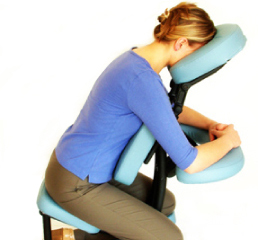 Chair massage treatment takes place whilst you are fully clothed and seated in a specially designed chair. and stress free. It's a quick pick-me-up and helps reduce tension. The results of receiving massage weekly or monthly, has tremendous healing, it's accumulative effect to the body's natural healing ability. Massage brings you relaxation, an increase blood flow, that allows oxygen to reach cells, and stretch out hardened tissue, leaving your muscles feeling supple. Massage can help expend productivity levels, leaving you with an overall sense of wellness, feeling balanced, aliviate pain, frustration and keeps you well charged to cope with challenges in our lives. It’s amazing what 30 minutes can do!